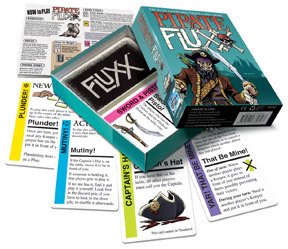 Pirate Fluxx is a fast paced light filler game. All of the rules are on the cards and during the game you change, add and remove rules. Pirate Fluxx evolves as you play it, your goal is to play a ‘goal’ card and then obtain the ‘keepers’ that the goal calls for. If at any point a player completes the current ‘goal’ then he/she immediately wins (unless someone plays a card that stops him/her from winning). At the start of the game the ‘basic rules’ are placed on the table and each player is dealt 3 cards. The basic rules force players to draw one card and play one card. You must always draw and play the number of cards determined by the current rules it is not optional. Now you’re ready to begin the evolving game of Pirate Fluxx. In a game where the rules and objectives are written right on the cards there is not much that needs explaining so instead I will just go over the different type of cards and what they do. New Rules: These change the rules for all players they range from a hand limit, play all your cards to drawing extra cards if you can talk in a pirate accent. When you play a card that makes players draw new cards you draw the difference, when you add a new rule that makes you play more cards, playing the rule itself counts as one of your ‘plays’ and when if there is a hand limit rule you discard down to the limit at the end of your turn. Keepers: These make up the core of the game, you need keepers to win the game but be careful because they can be stolen or destroyed and the goal can change on any player’s turn! When you play your keepers is a very important part of Pirate Fluxx. Goals: You objective in Pirate Fluxx is always changing, there are many different goals, but all will require you to possess certain ‘keepers’. When any player meets the criteria for the goal they win the game. Creepers: Creepers work similar to keepers except instead of brining you a step closer to victory they hinder you. You cannot win if you have a creeper (Unless you have a goal that says otherwise) and you have to discard a specific card in order to get rid of the creeper. The worst part about creepers is that as soon as you draw one you MUST play it in front of you and it stays there until you can get rid of it. Actions: Actions are what make Pirate Fluxx more interesting. They let you steal, discard, draw new cards, trade hands, swap keepers and a ton of other crazy actions. These are what make flux a fun exciting game, you never know what someone has up their sleeve and playing your actions at the right time can steal a victory from someone who did all the work for it. Surprise: In addition to regular action cards, Pirate Fluxx adds new surprise cards, these can be played on your opponents turn or your own and give a different effect depending on when you play them. They are extra useful to stop a player from winning or for giving yourself the win. Who would enjoy Pirate Fluxx? Family Gamers: It really depends on the age group, pirates are a big hit with some kids while other families find them violent and stay away from them. Pirate Fluxx however has no violence and surprisingly no adult themed cards. There is a fair amount of text on the cards so be prepared for some reading, however all the text is there to add / clarify rules and once you’ve explained the card types Pirate Fluxx is a really easy game that almost anyone can learn and enjoy. Casual Gamers: With playtime averaging around 10-20 minutes you can’t go wrong with this game. Pirate Fluxx is a great filler game you can play while waiting for friends, beer, pizza or a nearby game to finish. It is cheap and most importantly every game is different so as long as you don’t burn out playing too much. Gamer Gamers: Even though you are at the mercy of random card drawing and there are no serious strategic moves you can still find the most serious gamers enjoying a game of Pirate Fluxx. Why? Because it is a fast paced, light filler game and when you know that going into your game you tend to enjoy it more and relax a little. Fluxx doesn’t try to disguise itself as anything other than a filler game but that’s okay because all types of gamer groups need a few filler games. This is definitely one of the easiest games I have to just pick up and play. Great for times when you’re not looking for a whole lot of thinking or strategy. Knowing all the cards in the deck offers a mild advantage in knowing what goals are available to achieve, but it’s not enough to offer a significant advantage so everyone has a reasonable chance of winning. Most of the fun comes from Talking Like a Pirate, passing around the Scurvy and getting the Captain’s Hat. This is the best fluxx yet. Playing cards out of turn makes Fluxx awesome! But its still fluxx so there is that potential for giving away the game at any point or pulling out the first turn win. Add a Review for "Pirate Fluxx"